Heading into the space at 101 N Coast Highway in Encinitas that last housed Bull Taco is ChiKo, a fast-casual, modern Chinese and Korean eatery from three esteemed industry vets whose flagship Washington D.C. location is a current semifinalist for James Beard Awards Best New Restaurant. After a career working under Wolfgang Puck, including a decade at the celebrity chef's famed Chinese American restaurant The Source in Washington D.C., Chef Scott Drewno decided it was time for something new. 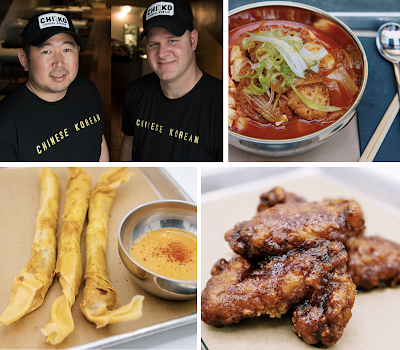 In 2017, Drewno partnered with two other successful D.C. restaurateurs - Mandu Korean restaurant chef and owner Danny Lee and former Matchbox restaurant chain owner Andrew Kim - to establish a new hospitality group called Fried Rice Collective. Their first restaurant concept, ChiKo, opened last summer in the Capitol City area of D.C. to huge fanfare, offering a lengthy menu that combines Lee’s Korean style with Drewno’s Chinese recipes. Earlier this year, it was announced that ChiKo was a semifinalist for the 2018 James Beard Awards Best New Restaurant category, with the winners set to be announced this May. The second location of ChiKo will install within the space previously occupied by Bull Taco in a quiet stretch of the Leucadia area of Encinitas. The restaurant will be no-frills with walk-up counter service and dishes served casually in metal bowls on sheet pans. The menu contains a wide variety of authentic and fusion Chinese and Korean dishes like pork and kimchi potstickers, braised cumin lamb with noodles, bulgogi rib-eye and rice cakes, and pork belly-kimchi stew. Small plates will range in price from $8 to $11, while more substantial dishes range from $14 to $18. The restaurant will also serve beer and wine. ChiKo is not expected to open until this Summer at the earliest. For more information, visit chikodc.com.